I went on hike this morning. 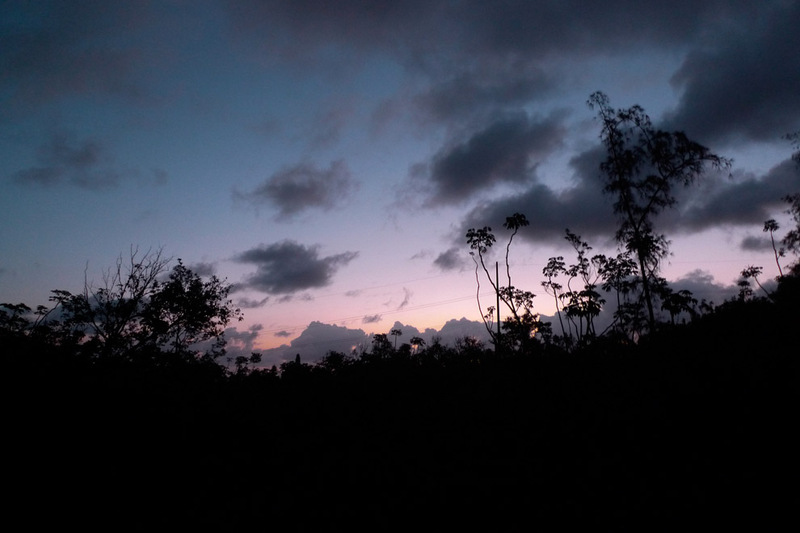 I woke up early to be on the trail well before sunrise. When we reached the trail head dawn was just barely breaking. It was the coolest hike I’ve ever been on. 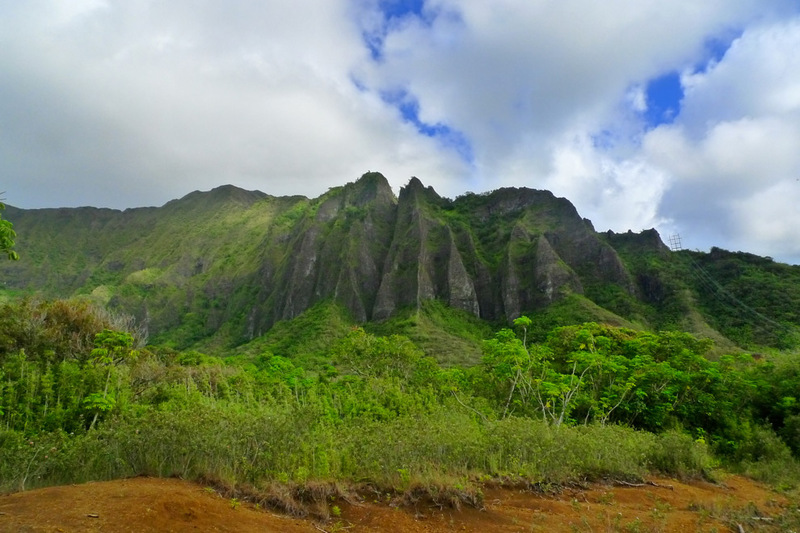 You may have heard of this hike. 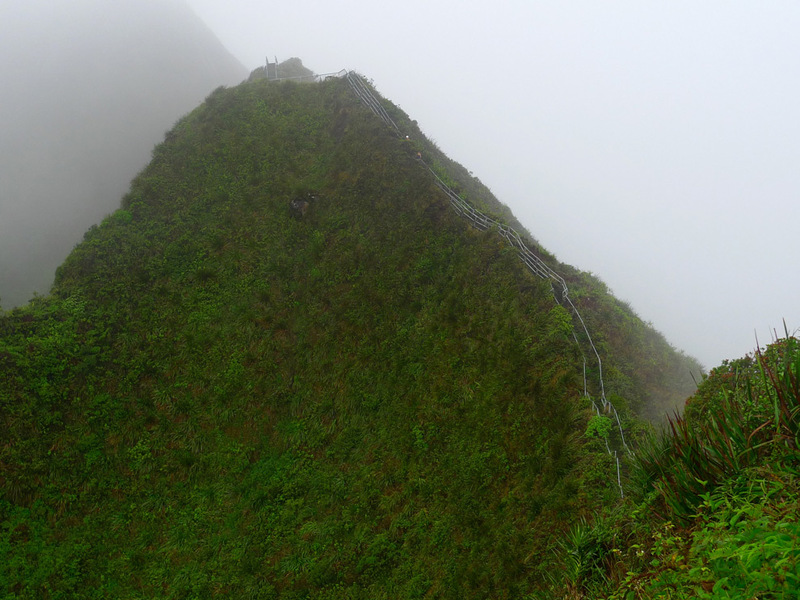 Most people refer to it as “Stairway to Heaven” but the official name, the one you’ll find on the trail head sign, is Haiku Stairs (or Haʻikū Stairs). 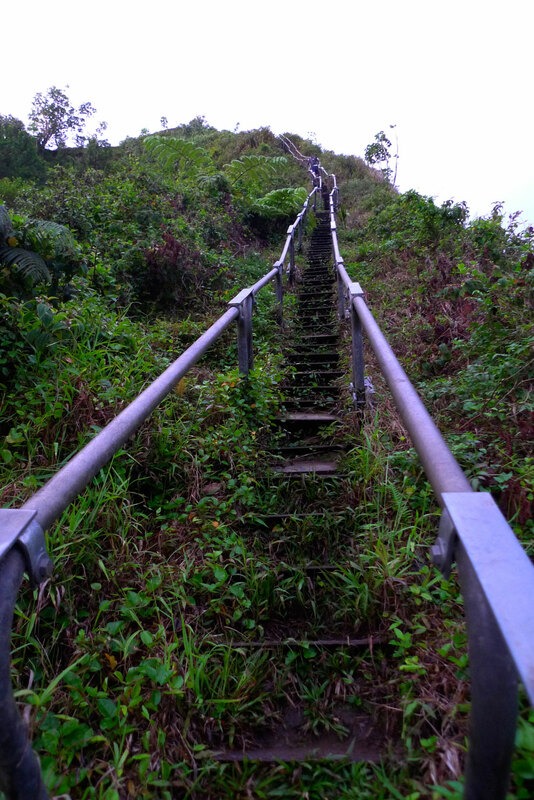 It’s a steel staircase made up of 4000 steps that ascends a ridge up from the Valley of Haiku near Kaneohe. 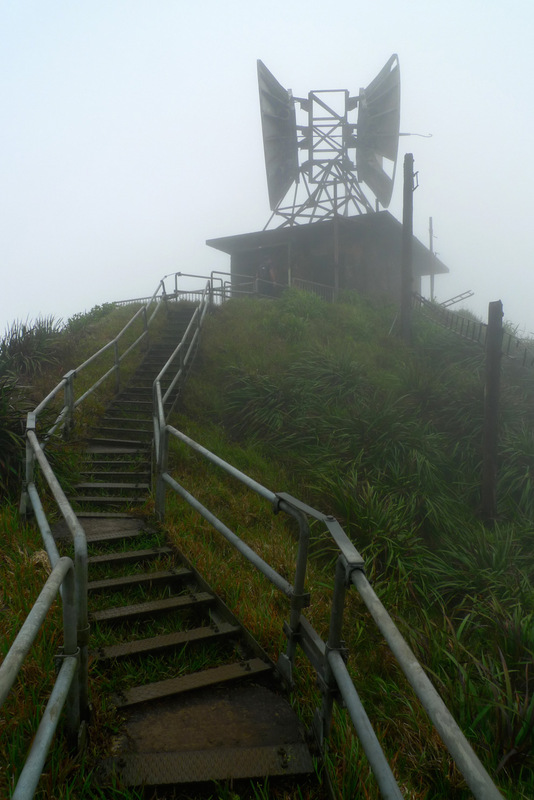 The steps were built so the military could access a radio station antennae 2000ft up on the mountain during World War II. PLEASE BE AWARE: This is officially a “CLOSED” trail. This hike is not sanctioned by the state and it is currently illegal to access the trail. 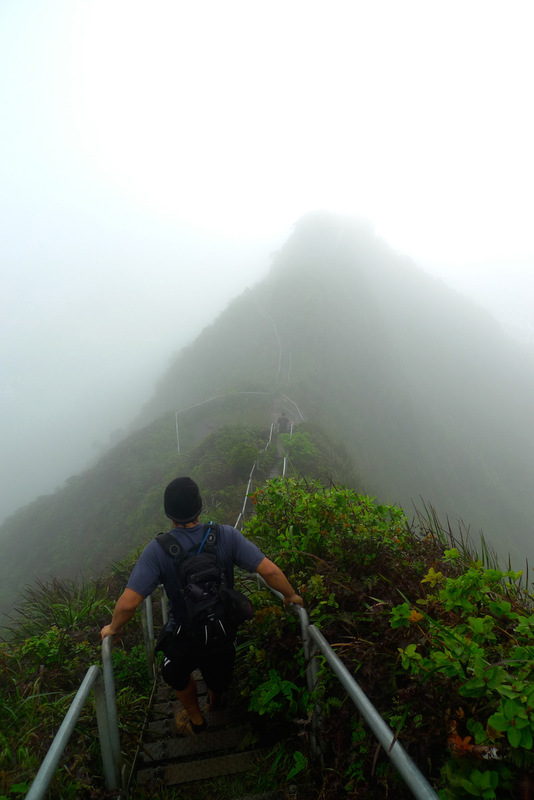 If you attempt this hike you are doing so at your own risk. Trail conditions and accessibility can change daily. 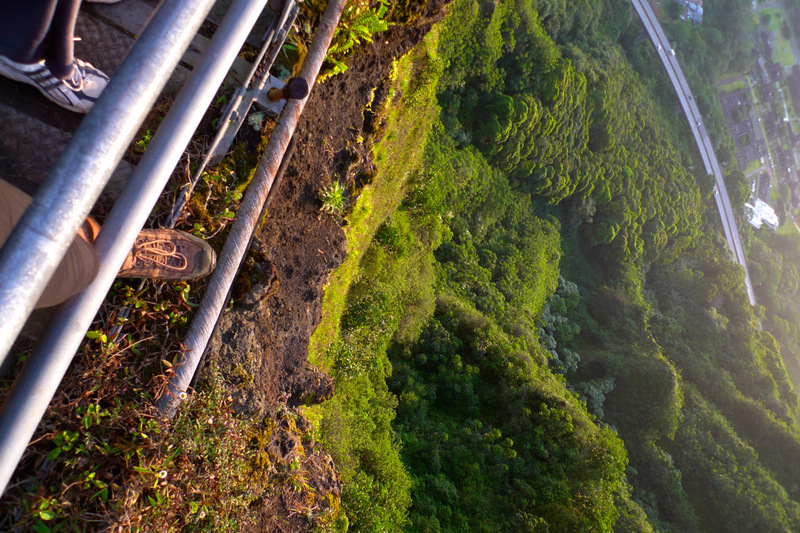 Also, hiking can be dangerous and has many potential hazards. It is up to each individual to know their limits, abilities and level of expertise before attempting any outdoor activity. UPDATE (7/6/2014): There are currently major access issues with this trail. The influx of hikers has created many problems for folks who live near the trail. And, the hike is still illegal to access. It’s currently recommended that people do not attempt to hike the stairs until a solution for trail access and parking is implemented. 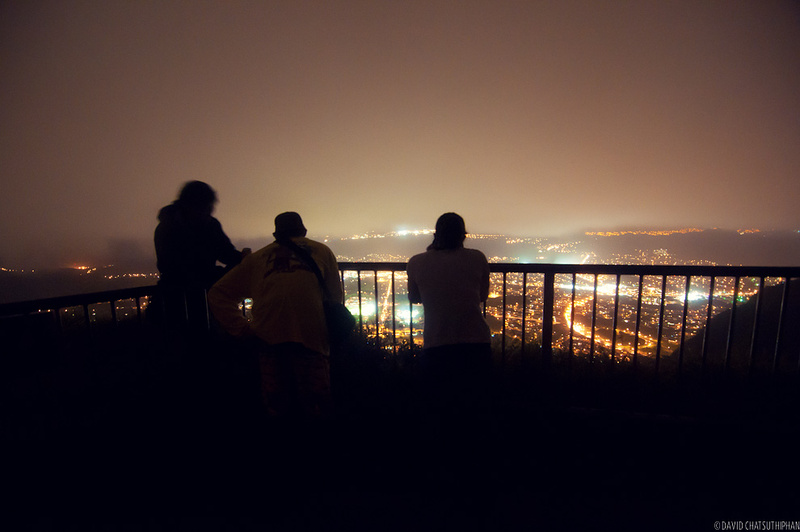 We started early with hopes of seeing an amazing sunrise. Here’s what the steps look like. 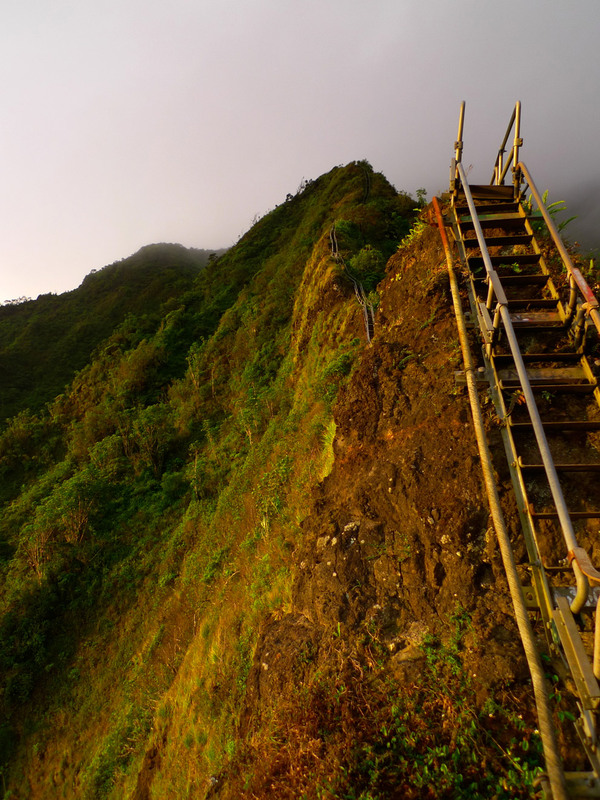 They are a series of ship ladders bolted together and mounted to the ridge with stakes. 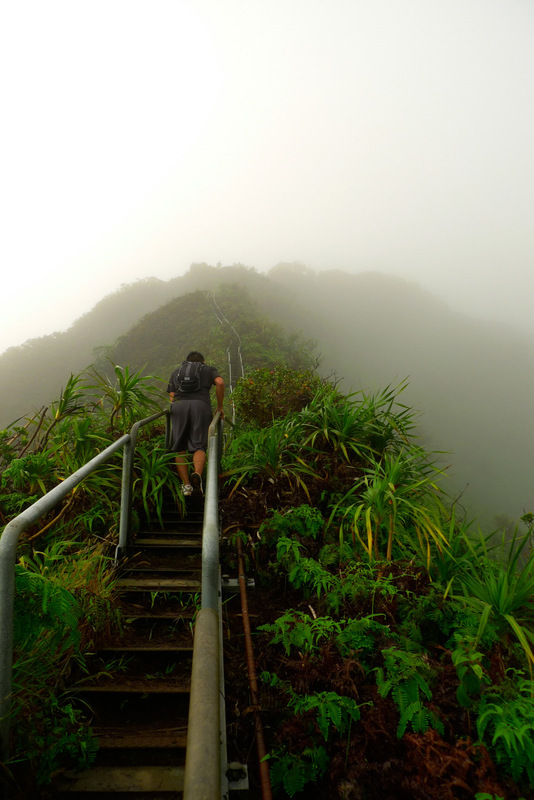 It’s intimidating at first, and the first section of the climb is a cardio killer / thigh burner. You can see drop offs here on the ridge. Thank goodness for the side rails. The stairs are broken up into 4 or 5 sections with platforms to rest on between each. That’s a good thing because it’s not easy to rest on the narrow stairs. And when you pass people going the opposite direction you have to step over the side of the rail to let them by. This is the view to the north. 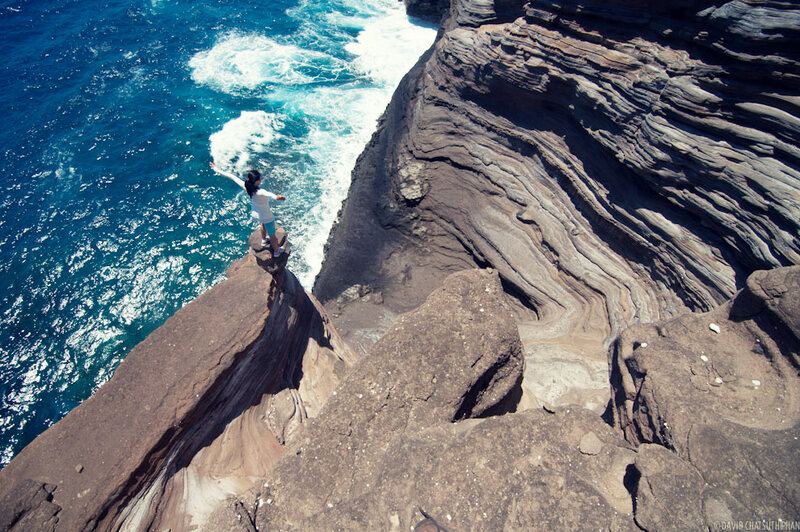 You can see Kaaawa at the top. It was cloudy towards the top today. This is the top. These antennae were used to communicate with the naval fleet during World War I. I read that they could communicate with submarines as a far away as Tokyo. And now we head down. Into the mist. Going down isn’t too bad but there are some steep parts. 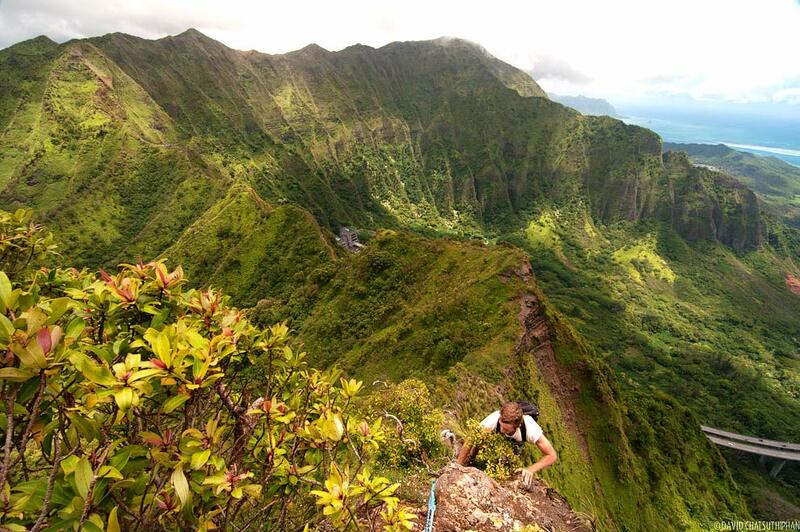 A fear of heights would not be good on this hike. Here’s the view to the south. You can see the three peaks of Mt. 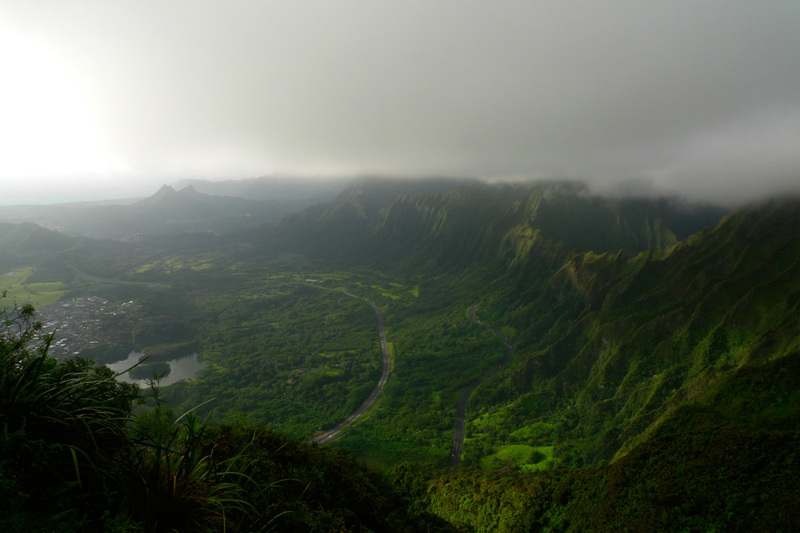 Olomana on the left. Here’s another section of the stairs. 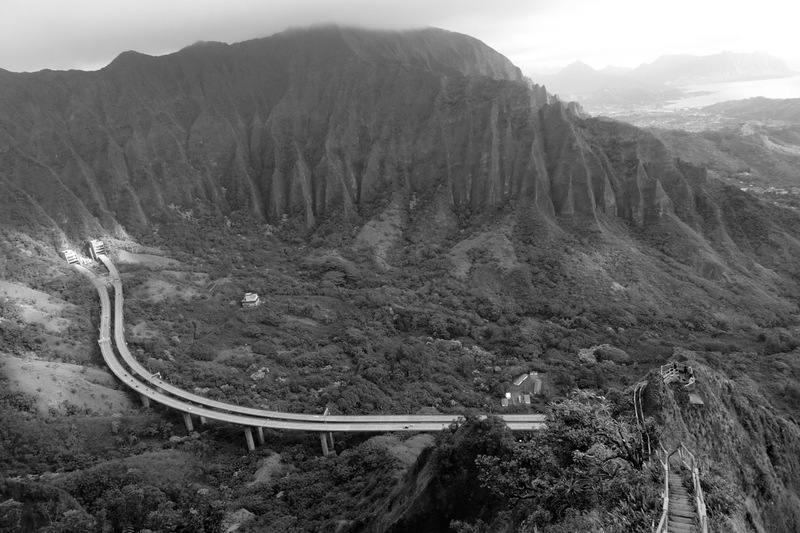 You get a good view of the H3 highway that cuts through the mountain. Once the sun came out I was able to get a view of the beginning of the stairs. This first section is intense. From the first step you’re going straight up the mountain. 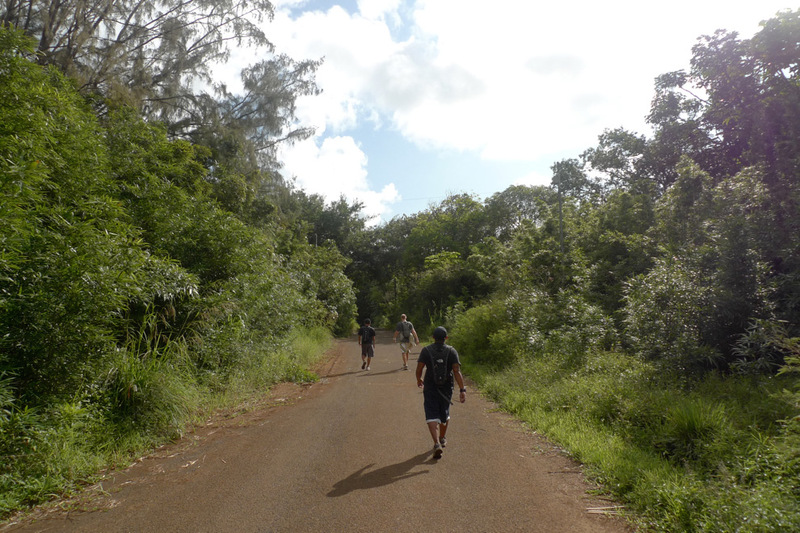 I would advise against eating a 7-11 manapua for breakfast on the day of the hike. I learned this the hard way. We’re walking back to the car now. The walk back to the street is also scenic. 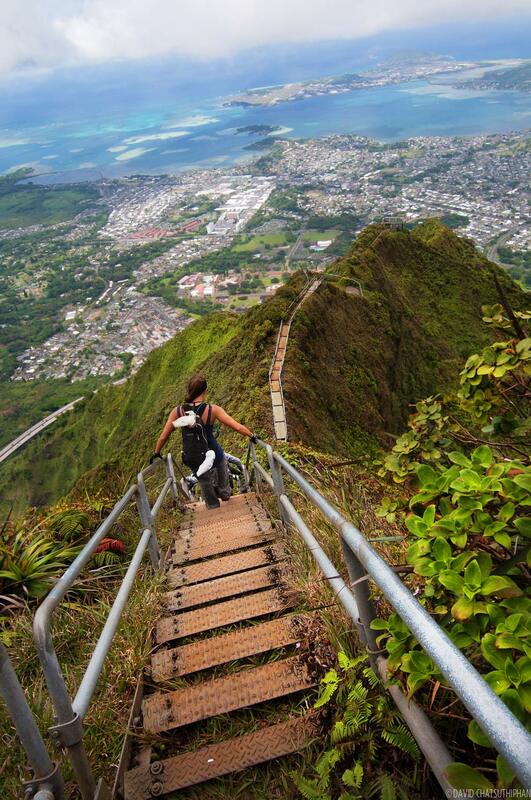 Haiku Stairs, a.k.a. 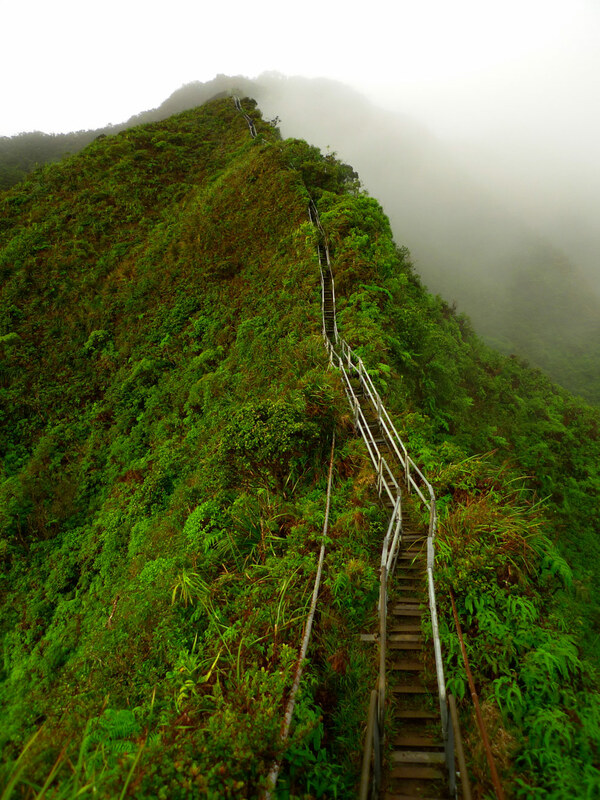 “Stairway to Heaven,” pau. 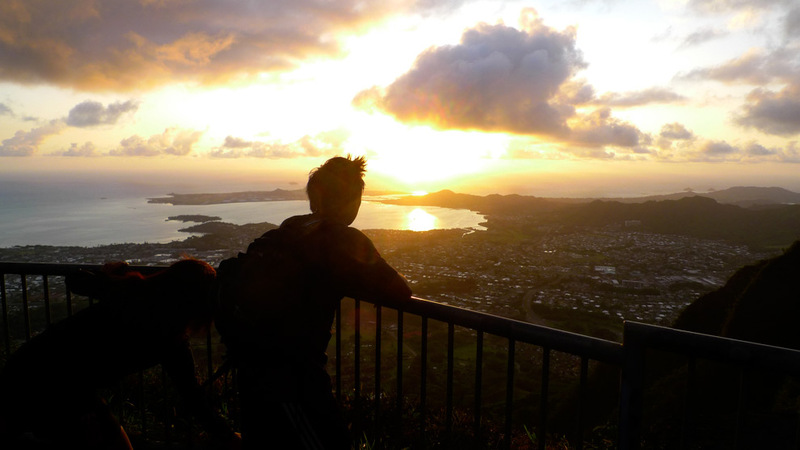 There is an extreme hike that starts in Moanalua Valley and ends at the Haiku Stairs. 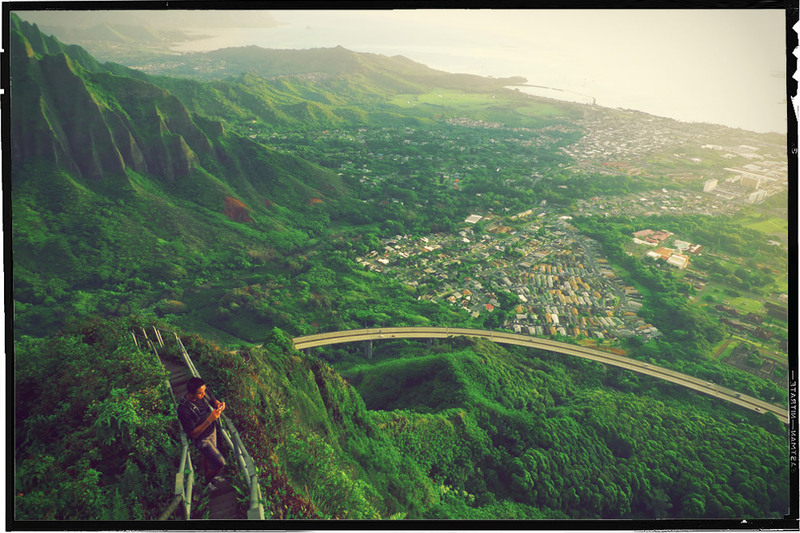 We descended the Haiku Stairs to get down from the mountain. 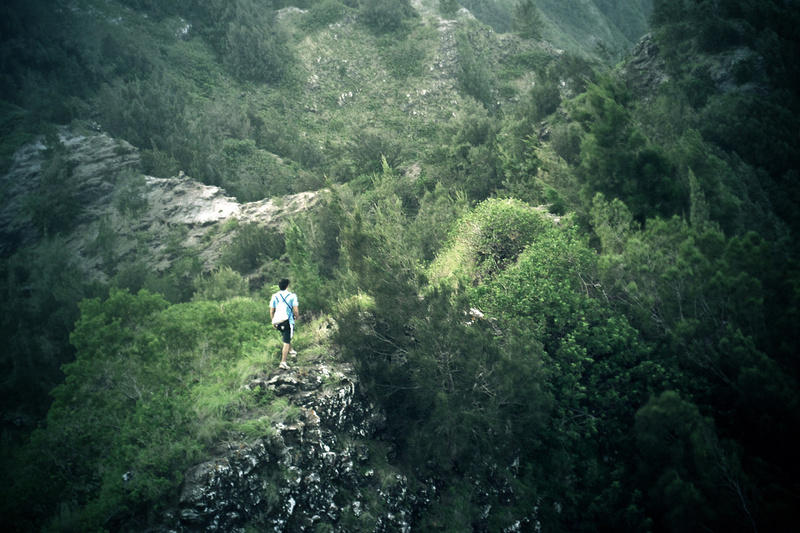 The hike involves climbing up several sections of eroded ridgeline. There’s a hidden set of stairs back here that are overgrown. 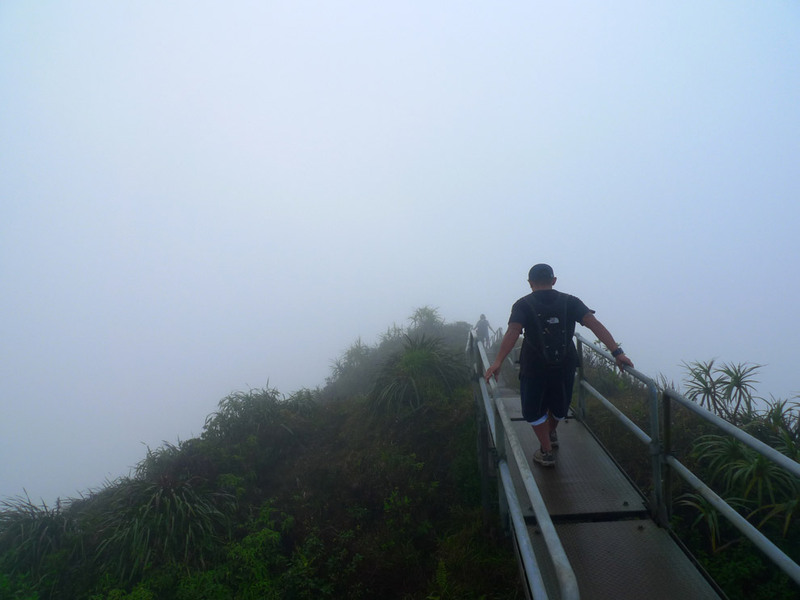 By finishing a hike at the Haiku Stairs, we got to see the view in the afternoon, when typically the morning clouds have burned off. 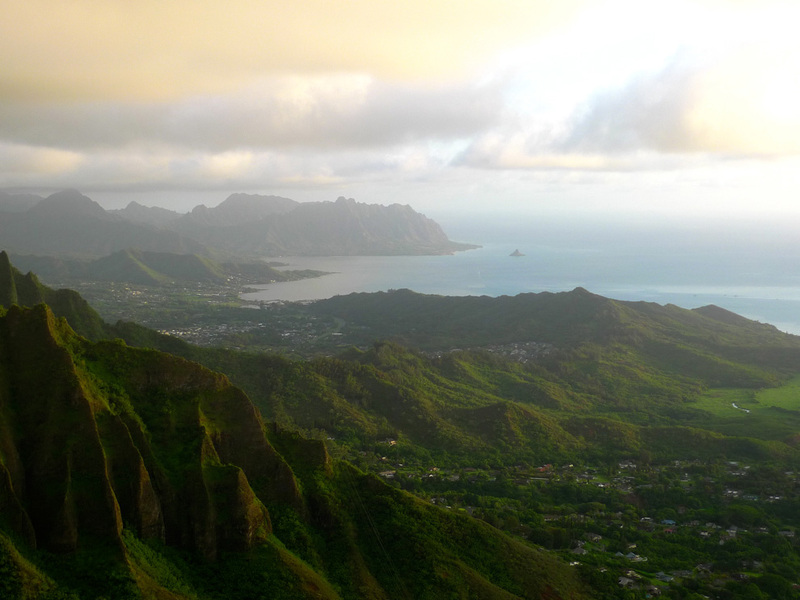 We got a clear view of Kaneohe on this day. 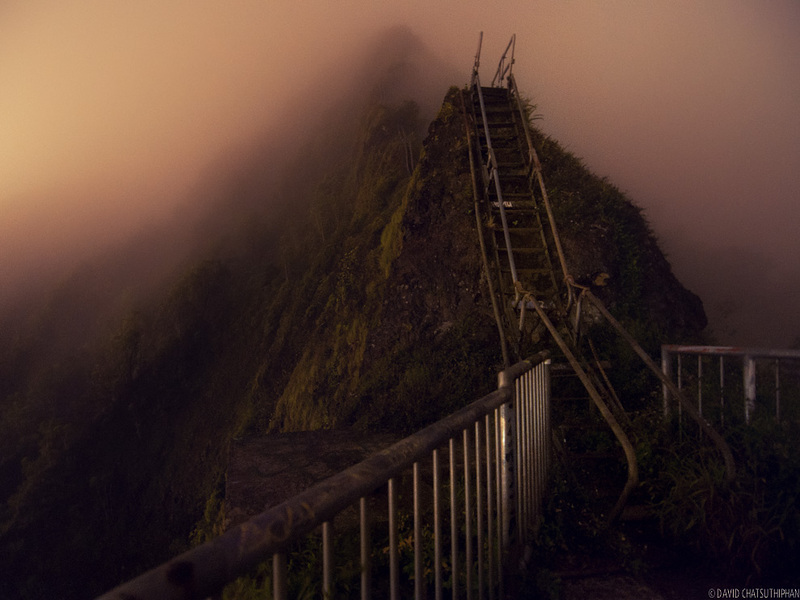 Some people choose to hike the Haiku Stairs at night. This is a little tougher because it’s wetter and more cloudy. [UPDATE: 3/7/2011] I used to have directions posted to the trailhead here but I’ve decided to remove them. People are reporting that the guard is turning away people as early as 3:30am. The new hours are in response to noise complaints in the neighborhood. It looks like this hike is going to be a bit less accessible for now. Let’s hope the state or city opens this treasure of hike back up to the public soon. If you still want directions, you’ll find them all over the internet. [UPDATE: 10/16/2013] It’s getting more and more difficult to access the trailhead. People have had to start as early at 2am to get there before the security guard shows up. [UPDATE: 6/4/2014] I’ve heard that security at the trailhead for the stairs is the tightest it’s ever been now. I’m not sure it’s worth the time and effort to hike the stairs at this time. 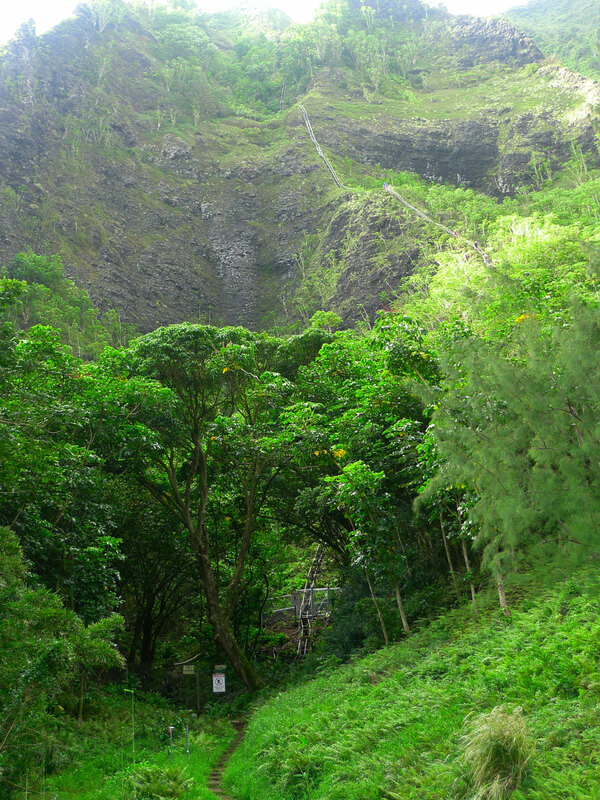 Hopefully a solution will be implemented that will allow people to legally hike this trail. 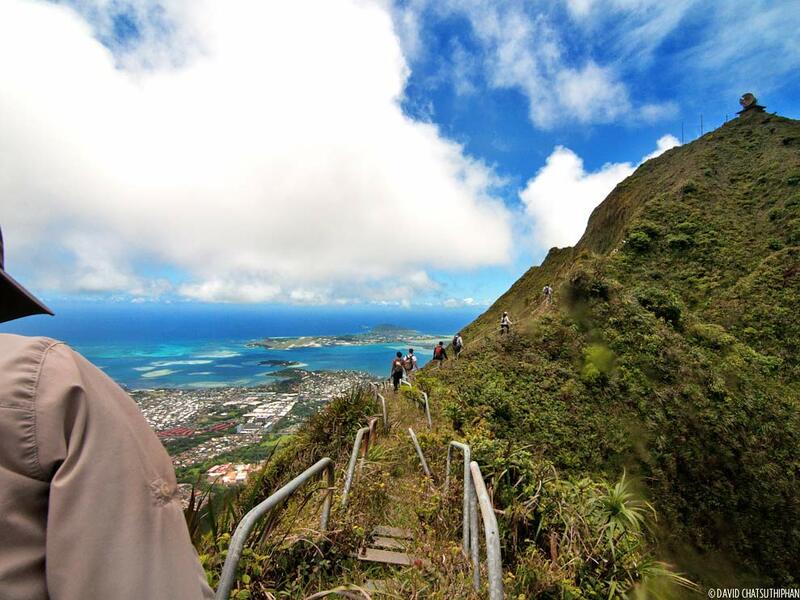 [UPDATE: 7/6/2014]: There are currently major access issues with this trail. The influx of hikers have created many problems for folks who live near the trail. And the hike is still illegal to access. It’s currently recommended that people do not attempt to hike the stairs until a solution for trail access and parking is implemented.